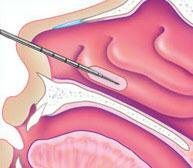 Coblation turbinate reduction uses a special needle to shrink and remove submucosal turbinate tissue. Turbinates are structures that jut out from the inside of your nose and serve to warm and humidify the air we breathe. However due to allergies or chronic sinus problems, these structures, specifically the inferior turbinate can become so enlarged as to block airflow through the nose. The Coblation needle is used to create scar tissue inside the turbinate which results in reduction of size of the turbinate and improved airflow through the nose. It is done in the office setting under local anesthesia. The insertion of the needle is for merely 10 seconds in the nose. Coblation technology provides ablation, resection, coagulation of soft tissue, and hemostasis of blood vessels in convenient one device.